Sandra Grienberger helped finance her studies with holiday jobs at voestalpine. 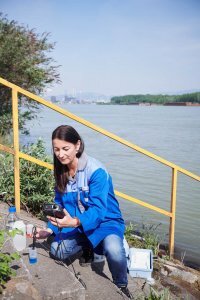 Today she is responsible for water and wastewater analysis in the Technical Service, Testing and Analytics department. “Environmental policy has a lot to do with sustainability and voestalpine takes its corporate responsibility in this area very seriously,” reports Grienberger who has a doctorate in chemistry. She sees herself as an environmental manager. 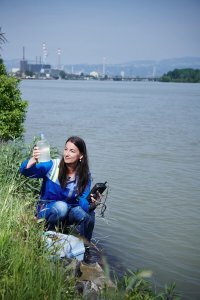 She and her six employees monitor all the wastewater and groundwater at the voestalpine Linz location. Seeking dialog with authorities, acting in an exemplary manner, cooperating with the environmental department, working meticulously—Sandra Grienberger knows how to put corporate environmental responsibility into practice. She sees voestalpine as a pioneer in this area. "The entire voestalpine Technical Service, Testing and Analytics department is constantly striving to stay up-to-date, and to speed up and simplify processes." In addition to daily routines and documentation obligations, she and her team are constantly working on developing new methods to be able to offer new analyses.